If you can’t get enough turkey, your in luck. It goes on sale after Thanksgiving in most grocery stores. Buy up several turkey breasts, keep them in the freezer and you’ll have them and this great recipe anytime. In a large bowl, combine oil, lemon juice, garlic, pepper, and thyme. Rub the turkey with the mixture, being sure to get under the skin, wrap it tightly in plastic wrap and place in the fridge for 6-24 hours. Place the breast in a roasting pan on a small rack to lift it off of the bottom. Cover with a tight fitting lid and roast 20-25 minutes per pound (about 1 hour 15 minutes) until an instant read thermometer inserted into the thickest part of the meat registers 170 degrees. 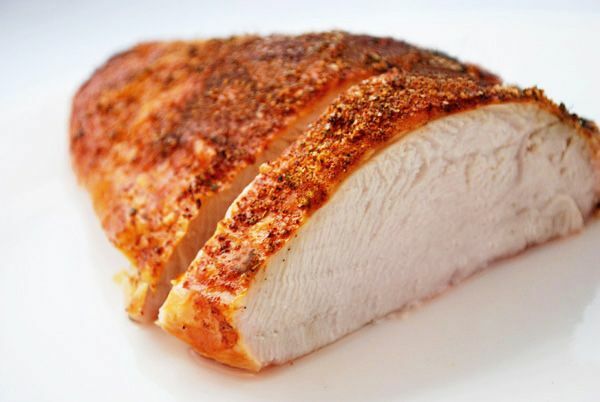 This entry was posted in Entrees, Holiday, Metabolic Medical Center Recipes, Modified Profast (Fast and Flexible) Recipes, Nutriplus Recipes (Balance Your Pyramid), Party & Entertaining and tagged boneless turkey breast, easy, lemon juice, main dish, marinate, turkey breast by foodies4mmc. Bookmark the permalink.